Set against the backdrop of the dramatic Dhauladhar mountains, Dhauladhar is perched on the high slopes in the upper reaches of Kangra Valley. The town is divided into two distinct and widely separated sections, Upper and Lower Dhauladhar, which differ almost a thousand metres in height. Today, Dharamshala has become the synonymous to the Tibetan government in exile and the home of Tibetan leader Dalai Lama. 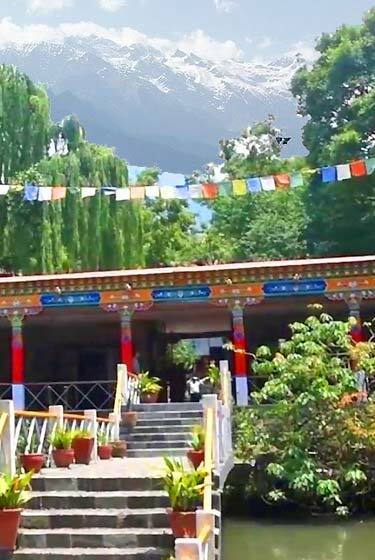 Even if the Tibetan community dominates the town, still it has retained the colonial lifestyle and British flavour Dharamshala over looks the plains and is surrounded by dense pine trees and Deodar forests. A nearby snowline with numerous streams and cool healthy atmosphere makes the surroundings very attractive. Lower Dharamshala is a busy bazaar town and has established itself as the travelers base camp, who come to explore the nearby mountains. The Kotwali Bazaar provides the entire color and characteristic of a small town, which is mixed with the simple life style. The colorful temple and Gompas, which reflect the culture of Tibet, adds attraction for the visitor. The Kangra museum gives an overview of the rich past of the region and on the other hand there are institutes that have been established to preserve the Tibetan art, cultures and traditions. MCLEODGANJ : Mcleodganj is one of the Famous hill Station in Himalayas, and This place also famous for His Holiness second home. The Budha temple is situated opposite the present abode of His Holiness The Dalai Lama and is well worth a visit and around it are situated Tibetan monastery and nunnery. The Tibetan institute of performing arts (TIPA) is just 1 km from Mcleodganj and preserves a number of musical, Dance and theatrical tradition of Tibet. KANGRA ART MUSEUM : Kangra art museum located at lower Dharamsala 9 km from Mcleodganj.The Museum house of Kangra paintings, Antiques, old traditional cloths and weapons of Royalties. ST. JOHN CHURCH IN WILDERNESS : St. John Church is built in 1852 this beautiful church is 1km from Mcleodganj. NORBULINGKA INSTITUTE : This interesting institute was established to keep alive the traditional arts and crafts of Tibet.It is 18 km from Mcleodganj. CHINMAYA TAPOVAN : Founded in 1978 by one of the finest proponents of the Bhagwad Geeta and the philosophy of Vedanta-Swami Chinmayanada, this is a place that exudes an aura of abiding peace.It is 20km from Mcleodgannj. WAR MEMORIAL : Set amidst beautiful surroundings and a place to visit in the afternoon this memorial is built near the entry point to Dharamsala to commemorate the memory of those who fought valiantly for the defense of the motherland. People offer a prayer here for those who set out of their houses and did not return to their near and dear ones. TRIUND : Nine kilo metres from Mcleod ganj Triund lies at the foot of the perpetually snow - clad Dhauladhar at height of 2875mts.The snow line start at Illaqa Got 5km from Triund and affords breathtaking view of the snow above and the valley below.It is a picnic and trekking spot. KUNNAL PATHRI : Kunal Pathri is a small picnic spot in Dharamsala.This is Rock Temple of local Goddess called Kunal pathri . LORD ELGIN’S MEMORIAL : After the horrors of 1857, india’s First War of Independence, Queen Victoria assumed the title of Empress of india.Her Prime Minister, Lord Canning made the proclamation and the Governor General’s titles was raised to that of Viceroy of india. DAL LAKE : Dal lake is 3 km from Mcleod ganj.It is not so large as its illustrious namesake in Kashmir.The lake lying amidst the hills and surrounded by fir trees. Has a certain charm all its own. Close to the cantonment, the annual fair in September is largely attended by gaddis and other hillmen. 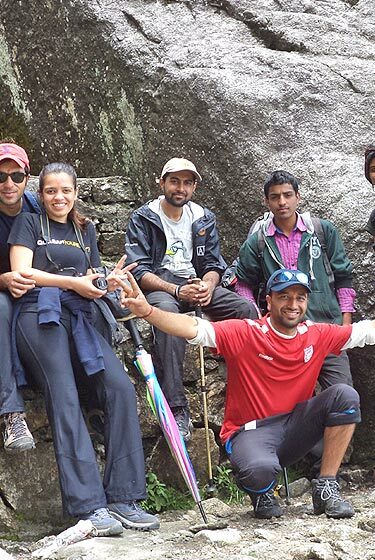 DHARAMKOT : Dharamsala is small hill of Dharamkot whose summit 2100mts. High is a favorite resort affording a panoramic view of the District of Kangra and the peaks of Dhauladhar. Now home of beautiful Resort for visitors. NADDI VILLAGE : A high point beyond the Dal Lake Naddi Village affords a magnificent view of Dhauladhar mountain range to the north and the vats expanse of lush Kangra valley to the south. 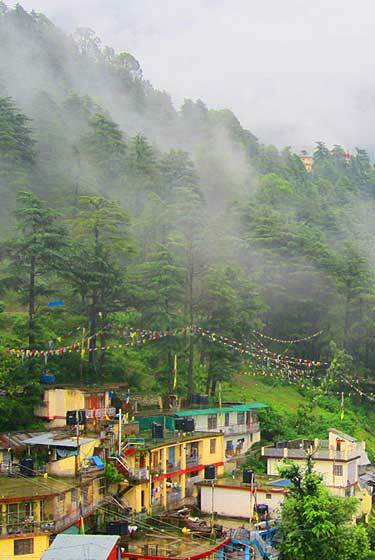 BHAGSUNAG : Near Mcleodganj is the shrine of BhagsuNag dedicated to Lord Shiva, not far from a small but lovely Waterfall. 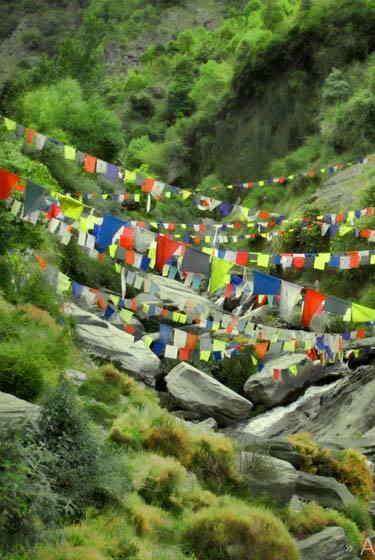 Within easy walking distance from the Mcleod Ganj.Baghsu nag is famous for its ancient temple, the tank and the spring are considered sacred by the Hindus. MACHHRIAL (TATTWANI) : Abounding in pleasant picnic areas, one better than the other, Dharamsala is full of surprises.There are hot springs situated at Tattwani, 25 km from Dharamsala but on the way, at Machhrial is a waterfall twice as big as the one near the Bhagsu Nag. CHAMUNDA MATA : 15 km fro Dharamsala and approachable by a motorable raod road is the famous temple dedicated to the Goddess Chamunda Devi.On reaching the temple a glorious view of the Dhouladhar on three sides and the Baner Khud, Pathiar and Lahla forest on the other is available. KARERI LAKE : Dharamslal abounded is picnic and beauty spots, at a distance of 15 km is the beautiful Karei Lake at a height 3048mts. Surrounded by green meadows oak and pine trees. MASRUR ROCK CUT TEMPLE : Masrur temple is famous fot 8th Century’s remarkable group of 15 monolithic rock-cut temples in north india in the Indo-Aryan style and richly carved.The Architecture is one of the finest examples of its type and characteristric of the time of the old Rajas are the sculptures that fill it.The temples partly ruined now are profusely decorated with sculptural ornamentation, conceived in the same manner as the great temple of Kailash at Ellora to which they still show their relationship. MAHARANA PARTAP SAGAR : This reservoir was created in 1975-76 with the construction of Dam on river Beas in Kangra District,for irrigation and Hydel power generation purpose.The Dam resulted in the formation of huge reservoir with a maximum waterspread of 314 sq km.Th Dhouladhar mountain from the backdrop of intercepting the wintering waterfowl on their Trans-Himalayan migratation to north and Central india.This reservoir was declared a Bird Sanctuary in 1983 and a National Wetland in 1994 which now been designated as an international Wetland (Ramsar Site).An area of 5 km around the periphery of the lake margins has been marked as a buffer zone for the management of bird sanctuary.The present waterfowl more then 220 bird species have been recorded from the Maharana Partap Sagar Bird Sanctuary.The sanctuary is an important staging area for an annual migratory waterfowl population of more than 20000 birds. ANDRETTA : Andretta is 13 km from palampur.Nestling inthe rolling plains of Kangra valley with a wide panorama of snowy mountain constant backdrop.Andretta has attracted many artists.The village was brought to prominence by Ms Norah Richards, the famous writer and dramatist popularly known as Nani of Punjabi Drama.Equally well known was her contemporary Sir Sobha Singh.Honoured with the titels of Padma Shri,Sobha Singh created most of his famous work Sohini Mahiwal, Heer Ranjha and a host of religious paintings.Many of these are displayed here in a gallery. DIP TSE-CHOK LING GOMPA : Down a steep path from the bus station, the Dip Tse-Chok Ling Gompa is a jewel. Perched on a steep hillside overlooking the valley, the main temple is small and intimate, but houses an impressive statue. Many of the young monks in residence here are intrigued by their visitors and, in halting English, will answer your polite questions. The Gompa also has a guesthouse for visitors and a trail that will lead you through the woods to the Dalai Lama’s temple complex. THE TIBETAN CHILDREN VILLAGE : Thousands of children flee Tibet each year and arrive in McLeod Ganj, often without their parents. The Tibetan Children’s Village is where they live and study, along with other Tibetan children whose Indian-resident parents send them to TCV to receive a Tibetan education.The children–over 3,000 of them–are housed in numerous dormitories and small apartment complexes near Dal Lake. STITCHES OF TIBET : The Tibetan Women’s Association has developed a number of vocational training programs to assist Tibetan refugees in developing employment skills. One such program is Stitches of Tibet, where newly arrived Tibetan women and girls are taught sewing and weaving skills. NAMGYALMA STUPA : Located in the center and surrounded by prayer wheels, this Buddhist stupa, is a memorial to those Tibetans who lost their lives fighting for a free Tibet. THE TIBETAN INSTITUTE OF PERFORMING ARTS (TIPA) : TIPA is located a short walk from the center of town. Another impressive complex built around an open courtyard, the Institute trains Tibetans (and occasionally foreigners) in the traditional Tibetan forms of opera, theatre and dance. TSUGLAG KHANG (Dalai Lama's Temple Complex) : Tsuglag Khang, The Dalai Lama’s temple complex, is the life-blood of the village. Located a short walk away from the bus station at the center of town, the complex houses the Namgyal Monastery (which trains monks for rituals associated with the temple), the main temple and a smaller shrine that houses a huge gilded statue of the Buddha, along with two smaller, but no less impressive statues of Chenresig and Guru Rinpoche. TIBET MESUEM : Opposite Tsuglagkhang, tel. +91-1892-22510.Small but interesting museum on the history of Tibet and its people. Open Tu-Su 9AM-5 PM, entry Rs.5.